While most bishops might have a quiet lunch or in-house Mass to celebrate six months in a new charge, it's eerily appropriate that, precisely half a year since he took up the nation's most prominent ecclesial post, tonight in New York will find Archbishop Tim Dolan hosting a multi-tiered dais of the city's white-tied elite. 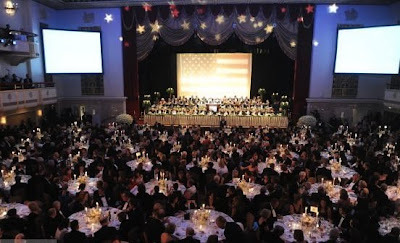 No, it has nothing to do with Dolan's six months -- it just so happens to be another edition of the Al Smith Dinner. Known as much for its roast-style atmosphere as the caliber of its guest list, Dolan's first turn at helming up the Waldorf-Astoria nosh -- a fundraiser for the archdiocese's Catholic Charities traditionally presided over by the city's top prelate -- finds the dinner taking a lower profile than it did the last two years. While the new archbishop's first Smith is the top line as news goes, and organizers recruited Joint Chiefs Chairman Adm. Michael Mullen to serve as guest speaker, even that can't match last year's double-bill when, for the sixth time in its history, the Al Smith brought together both presidential candidates for their final joint appearance before the election. Packed in to the walls, the 2008 Al Smith raised over $4 million for Catholic Charities, double the prior year's take as former British Prime Minister Tony Blair filled the keynote slot. The event is named for the former New York Governor (1873-1944) who rose from the Lower East Side tenements to become the first Catholic presidential nominee of a major party, losing to Herbert Hoover atop the 1928 Democratic ticket. With all eyes on the roasts, more on the speeches as they emerge.